Cut the top off the whole garlic bulb; drizzle it with EVOO and rub into the skin. Double wrap the garlic in foil and roast for 20-25 minutes in the oven or toaster oven. While the garlic is roasting, place the bread into medium size mixing bowl and pour the milk over it. Let it soak for 5-10 minutes. In another medium size mixing bowl, add the ground turkey. Make a deep well in the center by punching the meat with your fist and fill it with the two cloves of grated garlic, soaked bread, poultry seasoning, sage, nutmeg, shallots, Parmigiano Reggiano cheese and egg. Mix the meatloaf ingredients together, form a long, thin, oval-shaped loaf and transfer it to a sheet pan. Drizzle the loaf liberally with EVOO and roast for 45 minutes, until it reaches an internal temperature of 165ºF. While the meatloaf is roasting, work on the broccoli and cherry tomatoes: Trim the very end off of the broccoli stems with a peeler or a paring knife, removing the thick fibrous outer layer of the broccoli stems. Cut the broccoli lengthwise into large spears that look like long, skinny trees and place them along with the cherry tomatoes onto a sheet pan. Drizzle everything with EVOO and season with salt and freshly ground black pepper. Transfer to the oven during the last 30 minutes that the meatloaf is cooking. For the gravy, place a medium size saucepot over medium heat with the butter. Mash the whole roasted garlic cloves until they are nice and smooth and add to the butter. Once the butter melts, whisk in the flour and cook for 1 minute. Whisk in the chicken stock, then the milk. Allow the mixture to thicken, about 2 minutes, then stir in the Asiago cheese. Once the cheese has melted, season with salt and freshly ground black pepper. Serve the meatloaf with roasted garlic cheese gravy and the roasted broccoli and tomatoes alongside. In Recipes-list.com we have selected the most viewed recipes from category - uncategorized . Enjoy the best recipes specially selected for you! 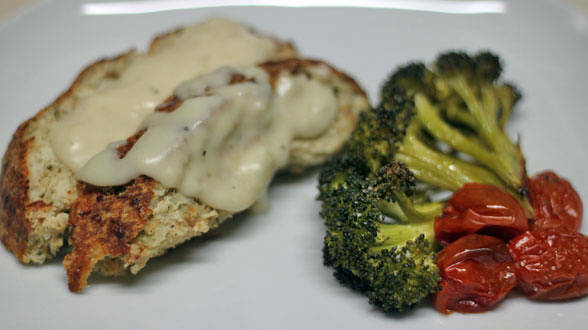 Turkey Meatloaf with Creamy Asiago Gravy, Roasted Broccoli and Tomatoes is the right choice that will satisfy all your claims.